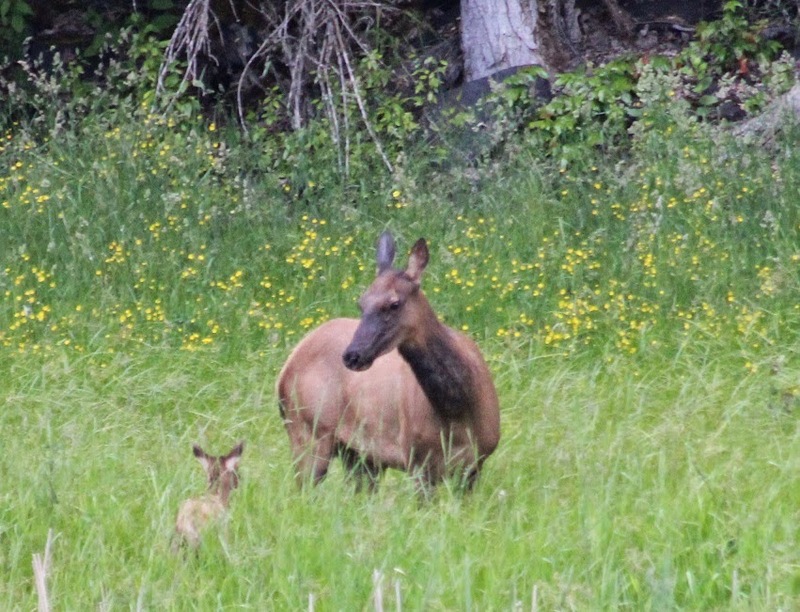 My wife and I decided some months back to take a long weekend in June, and head into the interior. As she had never been to Creston and I was in need of a little tidying up on my BC list, it seemed like a great idea. With the Thursday and Friday booked off, we both left work early on Wednesday, June 11, and headed for the 5pm ferry to Vancouver. Great plan but for the one sailing wait that left us sitting in the line up for over two hours, and put us into Princeton sometime between midnight and 1am. Thankfully we had decided against our original plan of spending that first night in Kelowna. Thursday dawned a little damp, with rain threatening, but it didn't dampen spirits. 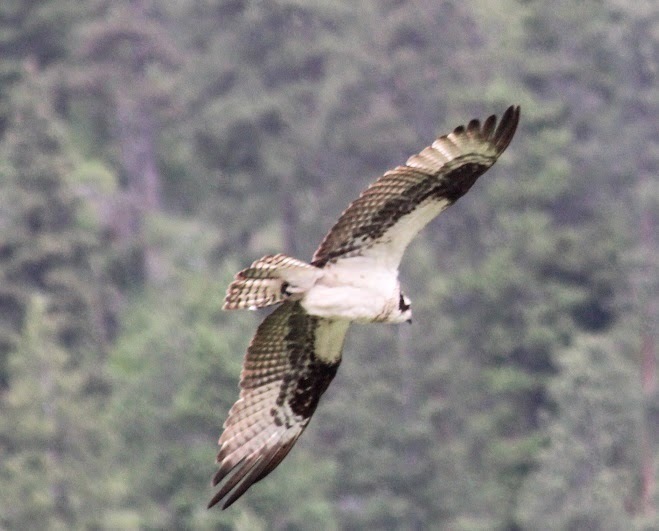 I had four targets for the following four days, all long missing BC ticks, being Black-backed Woodpecker, Forster's Tern, Wild Turkey, and American White Pelican. 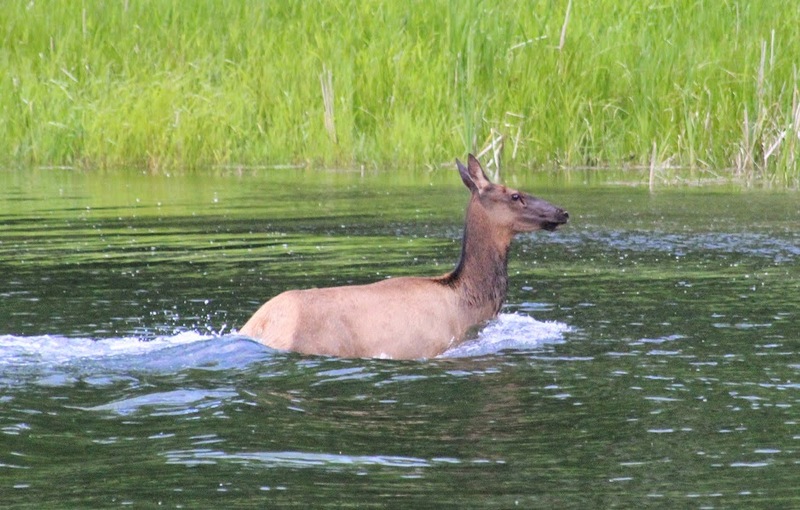 I had considered a run to Fernie for Common Grackle, but that one can wait. Our first destination was Old Hedley Road, one of my favourite scenic detours and always a good birding spot. 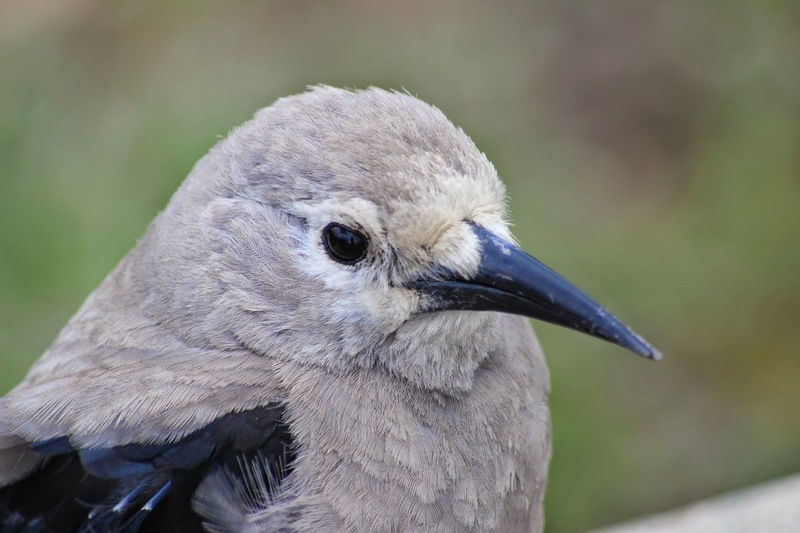 On this morning birds were good, and we picked up two unexpected birds, Lewis' Woodpecker and a Black-chinned Hummingbird that fed on flowers right under our noses. 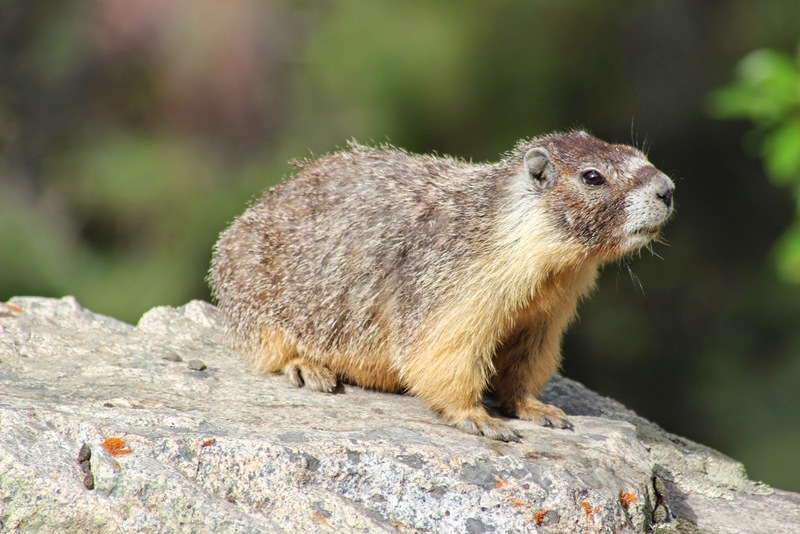 We also had a few mammals, including the ever present Yellow-bellied and Hoary Marmots. 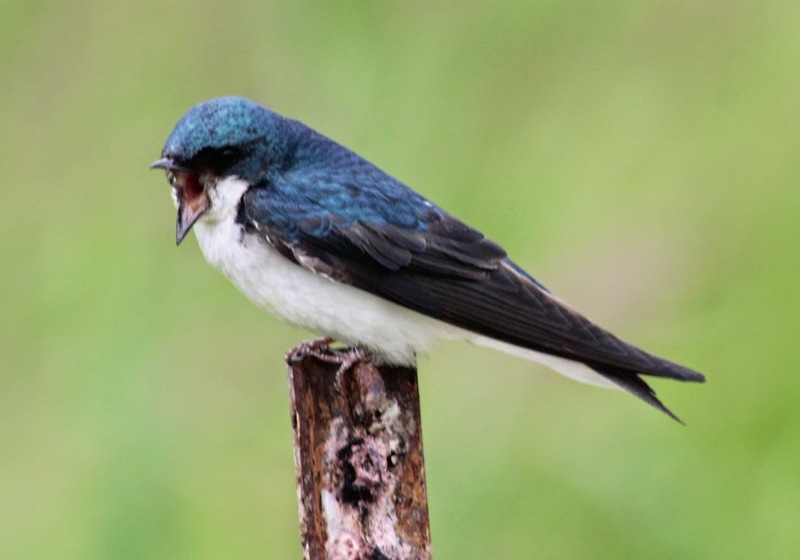 Many a time I have given the Naturalest Naturalist a hard time about posting pics of what I call "lesser winged creatures", ie bugs, and here I am posting the first of a few critters that don't even have wings..... go figure. Trucking on east we made a few stops, including Nighthawk Road, another stellar birding location. 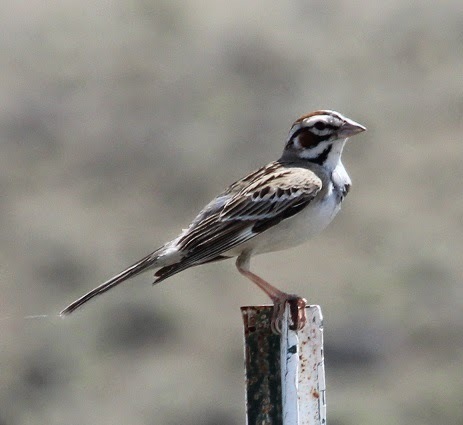 Sparrows were very evident, and even though we didn't find Sage Thrasher we did get good looks at Clay-colored Sparrow, Lark Sparrow, Vesper Sparrow, Brewer's Sparrow, and a few other species. I thought I heard a Grasshopper Sparrow through the symphony, but couldn't be 100% sure. Many new birds popped up between Osoyoos and Creston, including Swainson's Hawk and Williamson's Sapsucker on Anarchist Mountain, and birding was interrupted by a delightful lunch at the Greenwood Saloon with our new friend Dave (the things that only happen in small towns). 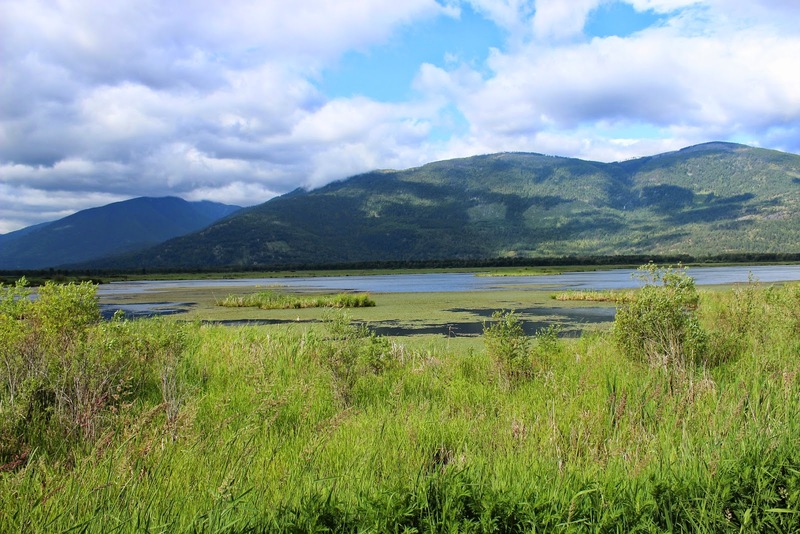 Once into Creston we headed up Topaz FSR, an area suggested by Russ C to get good looks into Leach Lake, a body of water frequented by the pelicans and recently a group of terns as well. We tried several vantage points but came up empty-handed, so we headed off to Duck Lake before checking into our hotel. 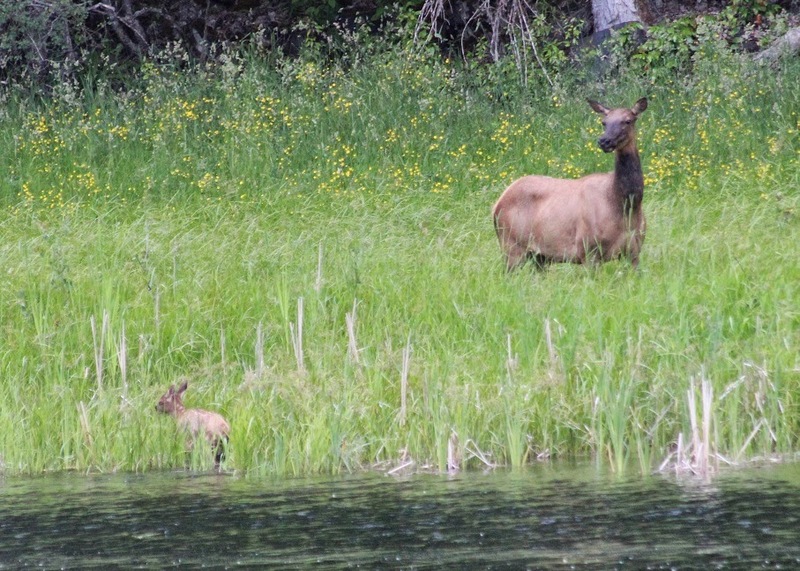 Our first highlight was once again not a bird, but a mother elk with a shiny new little one, swimming across a pond. Until finally they were reunited. 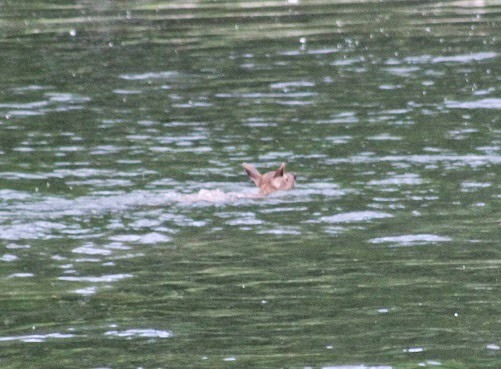 We dipped on our targets, but it was nice to see nesting Red-necked Grebes and Cliff Swallows. On our way back, we finally encountered one of our targets, and my BC Wild Turkey tick nearly ended in disaster, for the turkey. Driving south from Wyndell I noticed a Wild Turkey on the side of the road and pulled over, camera at the ready despite the fading light. 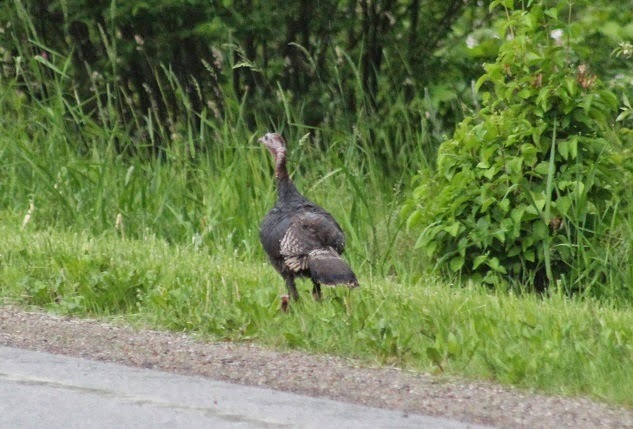 The turkey was unconcerned and starting walking toward us until a large truck with accompanying muffler issues drove by and startled it. The turkey ran across the road directly toward an oncoming car that, in true disregarding human fashion, didn`t even bother to slow down. I held my breath, expecting to see feathers fly, but the turkey pulled up at the last second and the tire must have just grazed the bird. Shaken, but not stirred, the turkey continued on it`s way, as much to it`s relief as mine, I`m sure. The following morning found us back at Duck Lake, again hoping for Forster`s Tern and again dipping. Brown-headed Cowbirds were very much in evidence, it seems they are having a good year everywhere this year. Black Terns were very visible as well, and we watched a flock feeding over the lake for 20 minutes. 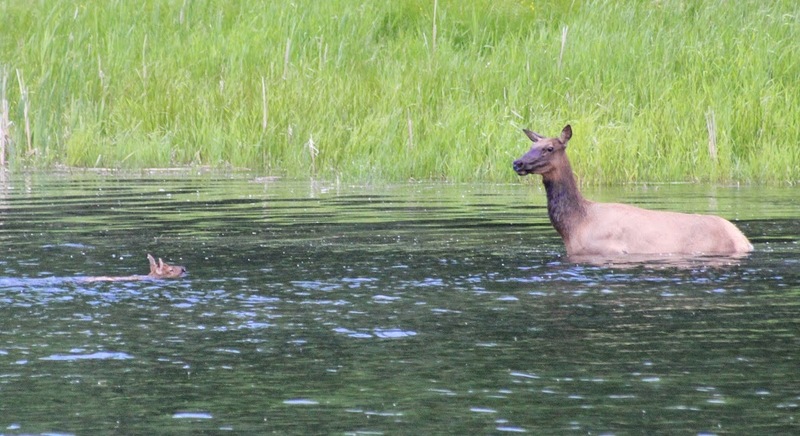 A spectacular surprise was a cow Moose, only the third I have ever seen, and Thea's very first! A nice late anniversary gift! 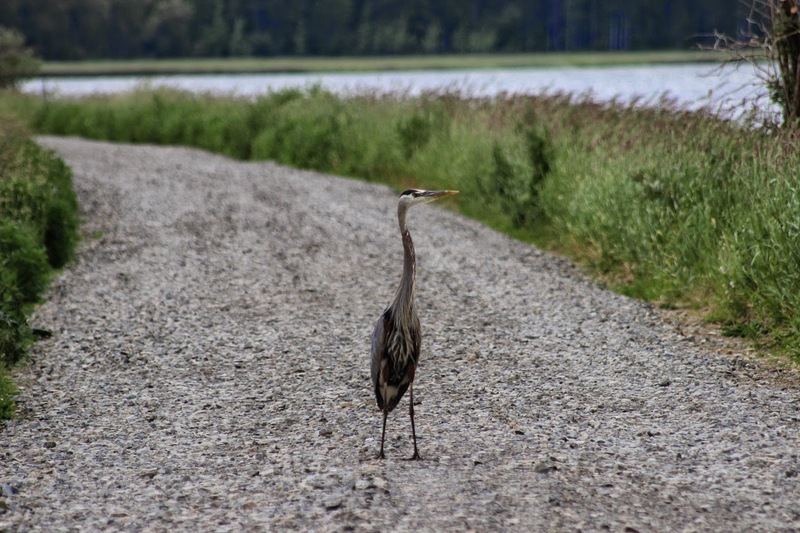 A trip out to the Creston Wildlife Area Interpretive Centre was a little bit of a letdown, as bird numbers were much lower than my last visit 15 years ago (a sentiment echoed by all of the locals I spoke with), but we did have some good birds. 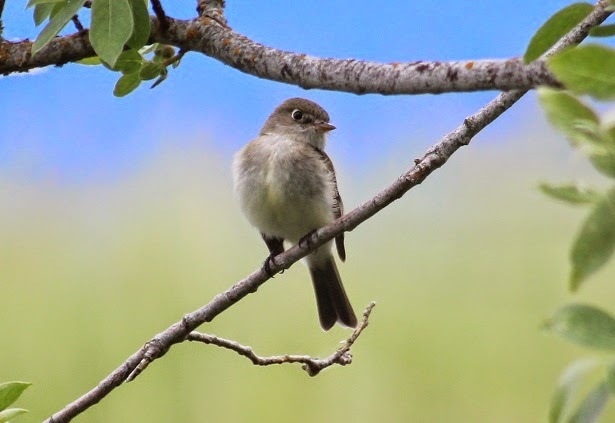 The Least Flycatcher played hard to get, but I won! 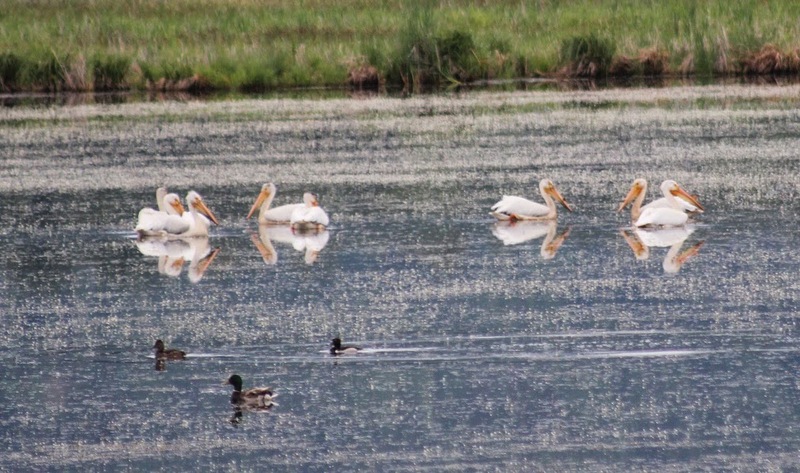 From there were headed back up Topaz FSR, where we finally got great views of a flock of 58 American White Pelicans lounging on an island. Not entirely sure how we missed them the previous day, but..... TICK! From there, back to Duck Lake, where we again dipped on the tern, but waterfowl numbers were much higher, and we managed to add what was at first a very distant white bird, but which turned into a very close Ring-billed Gull. Black-headed Grosbeaks and Bullock's Orioles were very visible but not photogenic. We decided to call it a night and take a bit of relaxation time at this point, and loaded up at a grocery store. Keeping in mind that the definition of insanity is doing the same thing over and over again, expecting different results each time, we headed back to Duck Lake on Saturday morning, our fourth visit in a day and a half. 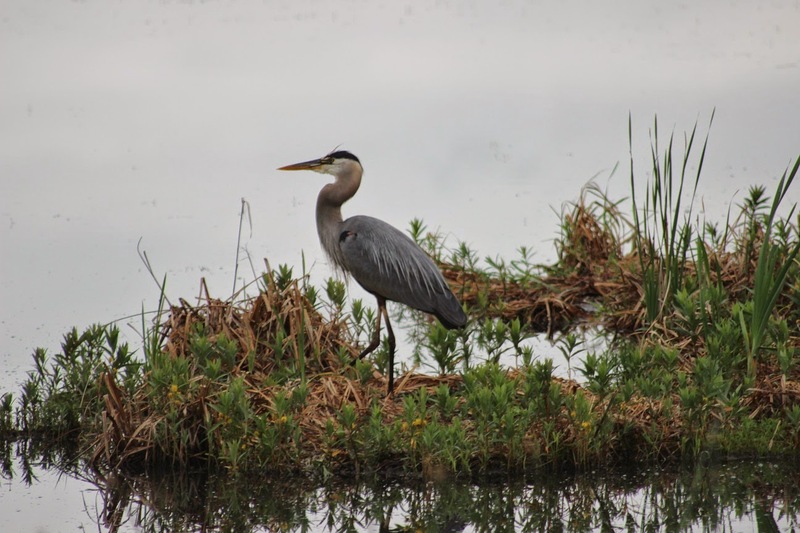 Each visit to Duck Lake had added some kind of value, and this was no different. As we were driving down Channel Rd a Coyote ran out in front of us and stood in the middle of the road, right until I had my hands on the camera. Nice trip mammal though. This was our most productive visit to Duck Lake, turning up 49 species in two hours. It was also our earliest visit, as we were onsite by 6:40am to beat the traffic. We walked the length of the road between Duck Lake and the south pond for a couple hours, and a flock of pelicans, 31 in all, had decided to drop in, my first for this location. Having dipped on our 11th hour tern, we were headed back when some kind of fate caused me to stop to take a picture of a flyover pelican, knowing full well that the light was terrible. After double checking the photo I turned to see if Thea was following me, and she was gazing toward the far end of the lake. "I don't think I see anything" were her words, but as I looked in the direction she was I saw a white bird, flying with a very bouyant flight. Tern! 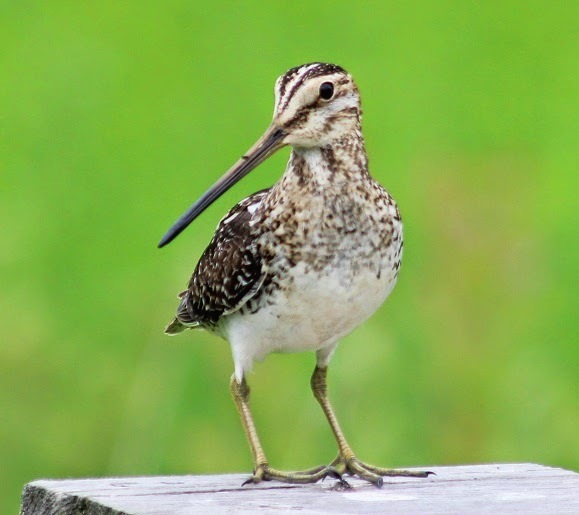 But..... Caspian had been report at Leach Lake as well. I quickly got the scope on it and..... Forster's Tern! Thank you Thea and Pelican! At this point it was easy to start heading west again, and we decided to drive the length of Reclamation Rd, just outside of Creston. Our first Bobolink of the trip were co-operative but again not close enough for a photo, but birds were fairly plentiful. Talk about using available materials! Found on Reclamation Rd. 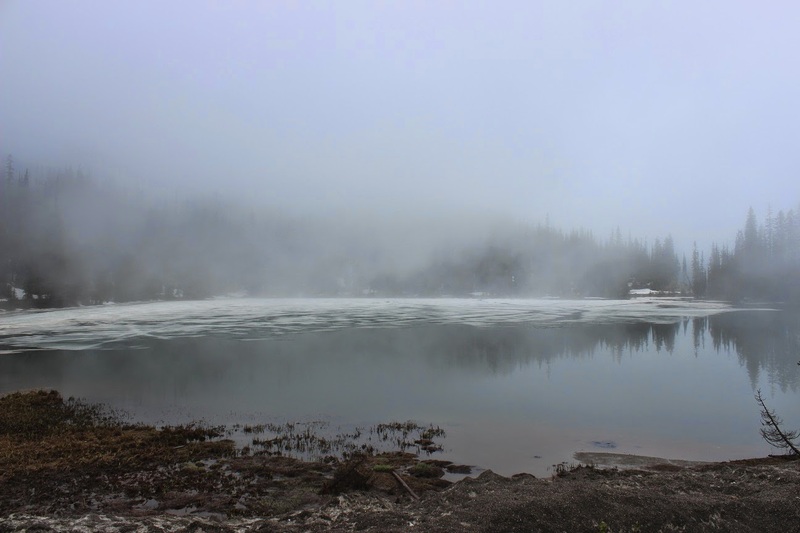 Bridal Lake was still half frozen, much to the chagrin of the Spotted Sandpiper that flew from chunk of ice to chunk of ice, and the fog decended very quickly, causing a fast retreat on our part. An uneventful lunch detour to Syringa Park north of Castlegar was a great picnic, but not much more. 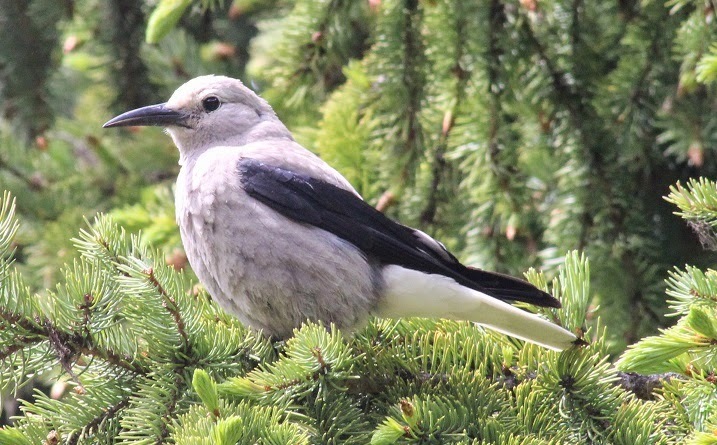 We stopped back in at Anarchist Mountain, and were greeted by Western and Mountain Bluebirds, our only of the trip, plus more Williamson's Sapsuckers, Pygmy Nuthatches, Red Crossbills, and a Pine Siskin. 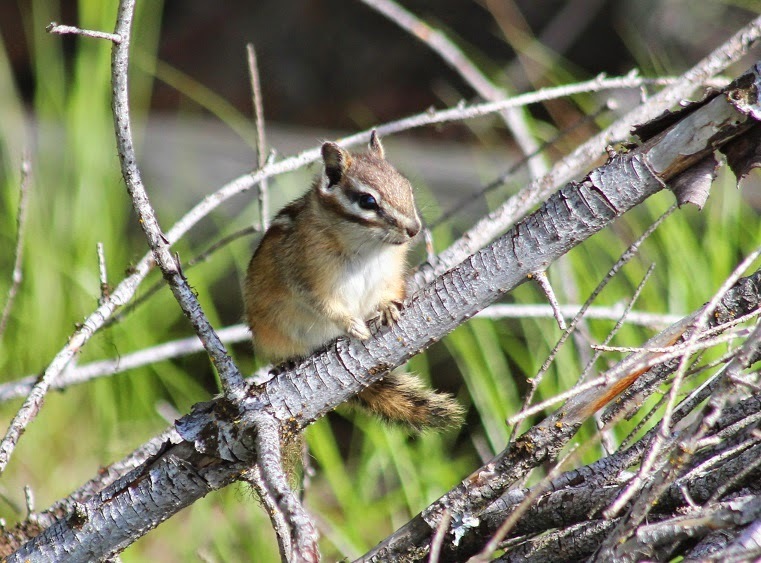 We also added to our mammal list, in the form of Yellow Pine Chipmunk. Another slack night ensued, and the next morning we headed for Road 22 and Black Sage Rd, the one area in Osoyoos that is my absolute must visit. 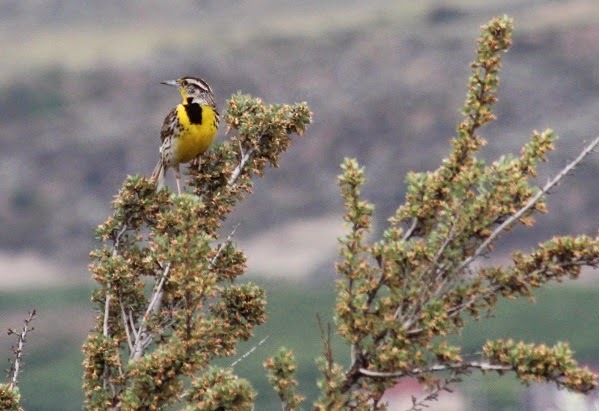 We added a few misses, including Yellow-breasted Chat, Lazuli Bunting, and Veery. 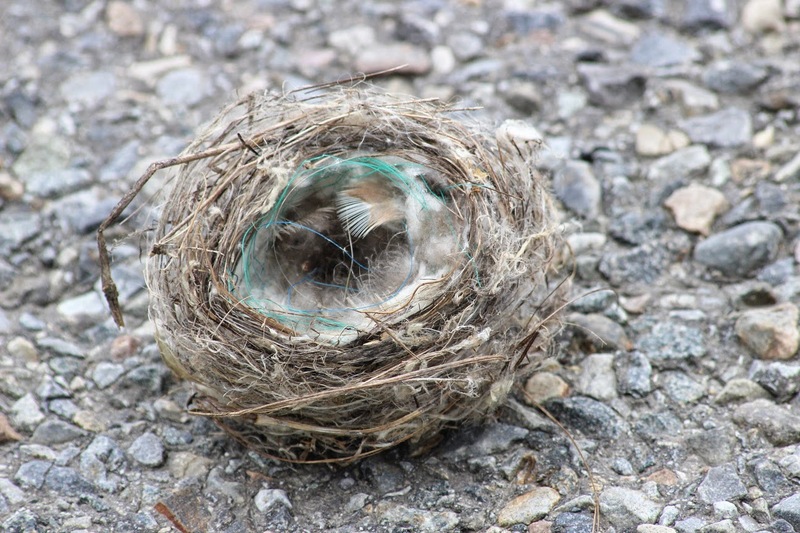 From there we went to Haynes Lease, where we added Rock Wren. 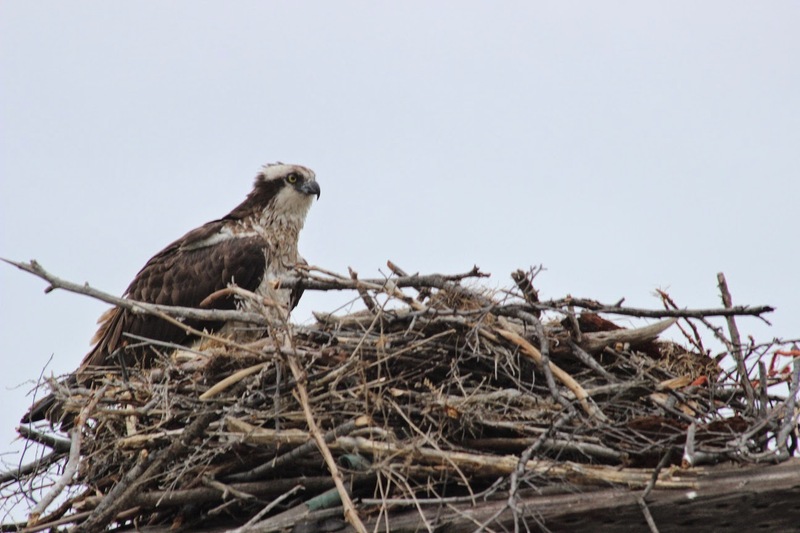 Osprey pair nesting on the bridge at Road 22. On the way west we had a single Chukar cross the road near Spotted Lake, and a pullover gave up brief looks at a total of 8 individuals. From there we drove Chopaka Road, a spot I have never taken the time to bird. 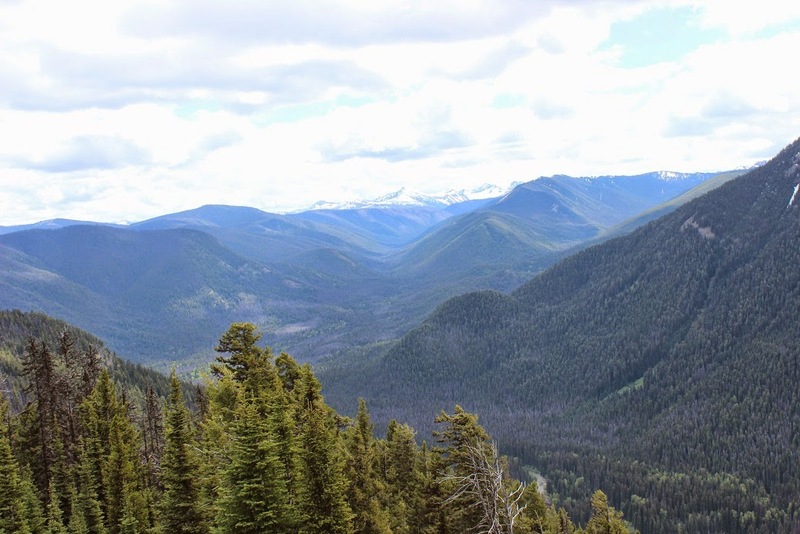 It was a great detour, but the "Look out for Snakes" signs proved to be lies, much like the "Watch out for Caribou" signs at Kootenay Pass. Manning Park Lodge and the Cascade Lookout were out last stops of the trip. The views from Cascade were amazing, but the weather was threatening and the wind came up with a vengeance. I was in the midst of making a sandwich on the hood of the car when the wind blew half of the bun onto the ground. Within ten seconds, a Yellow Pine Chipmunk had hold of the bun and was trying to drag it off. 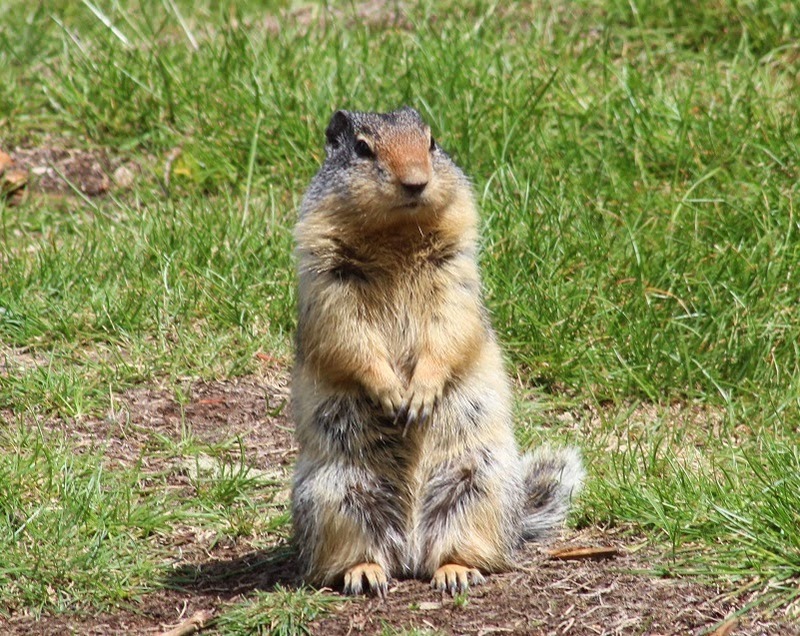 It was quite hilarious to watch, keeping in mind that if I were making my sandwich out of Yellow Pine Chipmunks I could have fit three or four of them on the bun. Eventually it gave up, broke off a piece, and a Common Raven took the rest. 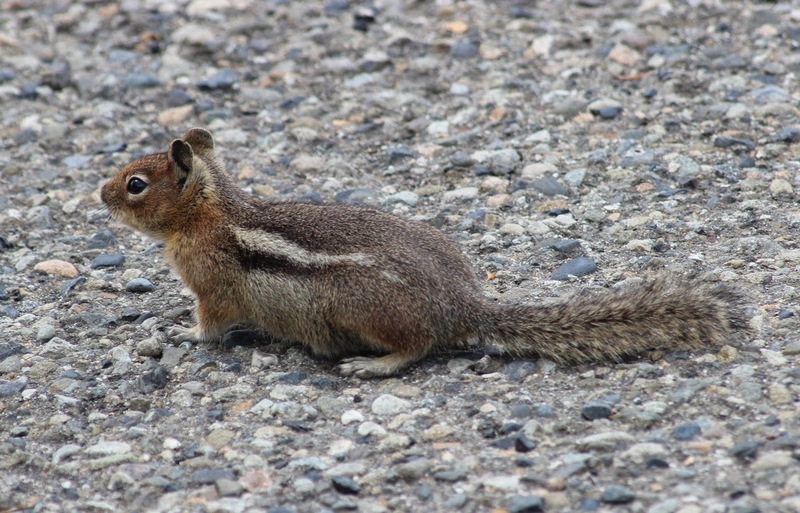 At Cascade Lookout we added Grey Jay, as well as a lifer mammal, Cascade Golden-mantled Ground Squirrel. On the ferry home we encountered a lone Orca. This was our last add, and in four days we tallied 127 species of birds, including 3 of my 4 targets, as well as 11 species of mammal. Not a bad weekend!